Every one's favorite commenter, Shannon, emailed me this morning in her usual snarky fashion......something along the lines of......"cue the advent calendar blog post by case". Hmmm.....am I this predictable? I have lost count at how long we've been doing this, but I believe it started about 31 years ago. My big brother, Chris, brought home this hand-drawn calendar and my family has been full of coloring fools ever since. I've recreated it each year for our children and it's a big Starnes family tradition now. Color each day until Santa arrives......and we celebrate the birth of baby Jesus. It's free.....it's easy......it's appropriate for all ages.......and it won't give your kids cavities. (***Coco, print this one out for sure). Punkin Jack stayed on day 1 today. Proud of our little guy! Baby Laine jumped ahead.....excused. She's only 2. Feel free to print it out and share it with your kids. Find it here. Oh, and save the comments on my artwork......it's a painful process, people......trying to draw these each year. I have ZERO artistic ability. Creativity? A bit. A natural talent for art? Absolutely none. And, don't even get me started on how long it took me to learn how to scan this thing. Few things make me feel more ignorant than scanners and printers. I love it and I know my kids will to! What a great family tradition! Thank you so much for sharing! You are AWESOME!! 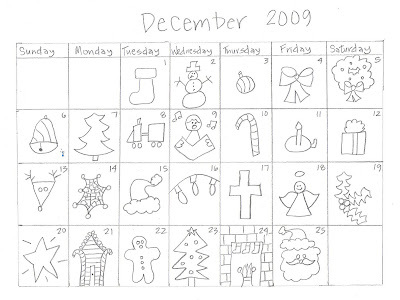 I have been trying to find an Advent Calendar Ashlyn would understand. This is great and I am totally copying you!! Thanks for the idea! You ROCK! Annnndddd... I don't think the art is that bad! Way better than mine would be. love this too and can you believe I've never seen this before? We always had the sticker or scratch and sniff calendars that you visited each day until Christmas. The Advent is a much better idea! Ouch. At least my kids don't eat graham crackers with icing for snack. I am glad you posted this b/c I totally forgot to bust it out this year. And the artwork isn't bad at all. But I think I will do my own. Uhm did Spiderman attack December 14th? Sass - you are a funny girl! It's a snowflake. And, you love it. Hey everyone - check Shannon's blog.....she's doing Christmas gift ideas and they're fantastic! This is cute! Tristan brought one home from school I lOVE. It's a bell made of paper with cute words on it. Dangling from it are 25 loops of paper intertwined. Each night we rip one off. I am going to print this for my kids. Your artwork is way better than mine would be. Our church mailed an advent calendar to Ashlin, but it is above the thinking of a 4-year old. Cracking-up at these comments. Love the picture of Jack. . .look at his cute little fingers!!! This is the very best idea I have ever heard.... I don't have my own babies yet, but ALL of my friends do and I am sharing this idea with them right away... and someday, I will do this with my kiddos too. How fun!!!! Love it! Printing it now. Genius! i love this idea... my kids would too. Another blogging question? How is your header so large??? What do you use? P.S. I promise I'm not trying to go all Single White Female on you (if you've never seen that movie, you'll need to watch it to know what I'm talking about!) I made my pictures bigger and now my header looks tiny. Very cute - love the new blog header!